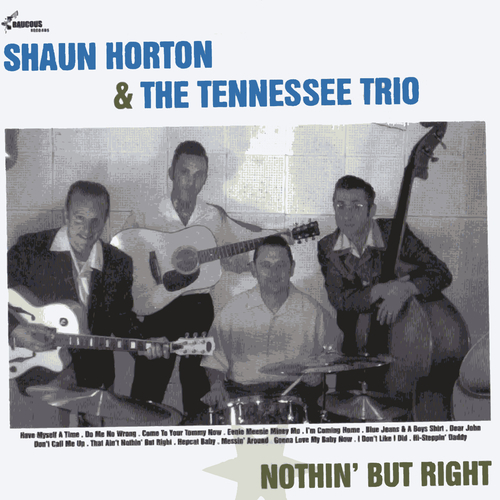 The debut album from Shaun Horton & The Tennessee Trio. This authentic style Rockabilly 4-piece was formed from of The Tennessee Trio. The expended line-up brings in a drummer, as well as a new bass player and a change in their sound. The Rustic Rockabilly and Hillbilly Bop is replaced by a more urgent, more dynamic and powerful style of 1950s Rockabilly, but their authenticity isn't compromised. Shaun Horton sounds vocally like one of the great undiscovered Rockabilly stars of the mid 1950s, and the band are tight and solid and never miss a boppin' beat. Complimented by the vintage recording techniques mastered by Chris Cummings at his Riverside Studio, this 14 track set is a real winner combining excellent Tennessee Trio originals alongside the classic '50s Rockabilly songs of Glen Glenn, Pat Cupp and Johnny Horton.